The land that was soon to be known as “Millionaire’s Row” was sandy and sparsely populated by cottonwood trees, one of which reportedly still bore bullets from the 1812 deadly confrontation between the soldiers and families fleeing Fort Dearborn and Native Americans. Named because area surrounded by a prairie. It was an old Indian trail from Ft. Dearborn to Ft. Wayne. Settlers left the fort on this road. In the 1850s, railroad related industries prospered near the lumber district along the South Branch of the Chicago River. Thus, the business district began to supplant the elegant residences along Michigan and Wabash Avenues south of Jackson Boulevard. Shortly after the Civil War, the city’s wealthy residents settled on Prairie Avenue due to its proximity to Lake Michigan, its open space, its easy access to the growing downtown and the fact that traveling there did not involve crossing the Chicago River. In 1870, Daniel Thompson erected the first large upper-Prairie Avenue home. Marshall Field followed in 1871 with a Richard Morris Hunt design. Prairie Avenue was the most posh Chicago address by the time of the Great Chicago Fire of 1871. Many of South Michigan Avenue’s elegant villas were destroyed in the Great Chicago Fire of 1871. The post-fire South Side of Chicago grew rapidly as all economic classes left the city’s center. Many of Chicago’s elite families settled along Prairie Avenue. By the 1870s and 1880s, Prairie Avenue was the location of elaborate houses between 16th Street and 22nd Street (now Cermak Road). In 1886, the urban elite, including George Pullman, Marshall Field, Philip Armour and John B. Sherman all owned family homes in this area that created an opulent Prairie Avenue streetscape reminiscent of European city streets; as such, it was widely regarded as the city’s most fashionable neighborhood. Businesses, such as the Pullman Company, Armour & Company and D.H. Burnham & Company, with ties to Prairie Avenue had national and international reach and impact. Additional grand homes (including many Queen Anne Style architecture and Richardsonian Romanesque) were located on Prairie between 26th and 30th Streets starting in the mid-1880s. In the late 1880s, sixteen of the Commercial Club’s sixty membfers lived on Prairie Avenue. The last mansion, a three-story Georgian Revival residence with 21 rooms, was built in the district at 2126 Prairie Avenue in 1905. A social event like the Mikado party hosted by Anna Field (1905) tried to put a Chicago spin on an international cultural phenomenon. Within a decade, however, Prairie Avenue’s influence was in sharp decline. The avenue’s titans were dying: Wirt Dexter in 1890, George Pullman in 1897, Philip D. Armour in 1901, William G. Hibbard in 1904, Marshall Field in 1906. Their children, even those who had originally lived on Prairie Avenue, were moving elsewhere, helping to create new elite enclaves. Family names once considered “Prairie Avenue” were increasingly identified with places like Lake Forest and Libertyville. The homes in which they once lived turned into rooming houses. Death had been such a frequent visitor that the street might have been called an avenue of widows and widowers. Even where the widows continued to live in family homes surrounded by servants, the coach houses and other rear buildings were turned into homes for renters. In 1910, wreckers destroyed the mansion at 1720, the first of many Prairie Avenue homes to be torn down. The age of the homes, the expense of modernizing them, the expanding vice district to the west, and the factories and warehouses that had already replaced residences on nearby streets made Prairie Avenue an unattractive residential site for the few families who could afford to buy the houses there. Light industry and vacant lots overtook Prairie Avenue during the second half of the 20th century. The elegant mansions were mostly torn down or fell into extreme disrepair. The children of the older families didn’t want to live there, and neither did the new wealthy families. By 1910, many of the houses had been converted to rooming houses or factories. 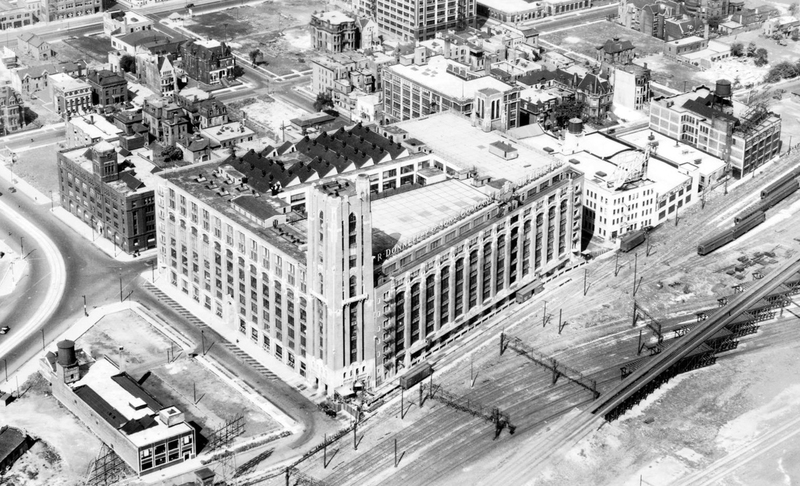 In 1915, the Hump Hairpin Manufacturing Company factory became the first to replace a residence on Prairie Street, while the R. R. Donnelley & Sons printing plant broke ground a block away on Calumet Avenue in 1912. By 1930, the elite world of Prairie Avenue had all but disappeared. By the 1970s, most of the residential buildings had been replaced by factories and parking lots Starting in the late 1990s, the downtown housing market flourished in Chicago and the resulting boom that has transformed many neighborhoods revived Prairie Avenue, causing most of the factories to be demolished or converted to loft condominiums. The factories have been replaced by condominium projects and most of the remaining mansions have been renovated. An aerial view of what the neighborhood looked like in 1935. This view, looking northwest, has the R. R. Donnelley plant in the foreground, depicts the numerous other printing companies surrounding the remains of the original mansions. Seeking more information on the architectural practice and archive of Lavall Dixon. Mr. Dixon desing Daniel M. Thompson’s 1936 residence (and others???). Any leads and help are greatly appreciated! !